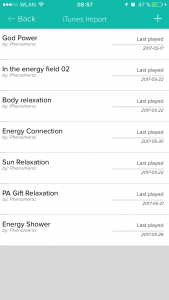 Mind Hero app offers a very easy to use Player for listening and tracking the progress of your relaxations. We are aware though that some of you have their audio files which you bought through other channels, so you wonder how one could import them into Mind Hero? Well, we didn’t forget you! On the selection screen, there is an option to import audio files from your Music app. The process is straightforward; it takes few seconds to copy the file into our app. If you wish to save space, you can remove original file from the Music app. Now, some of you don’t have your audio files on the iPhone at all. In that case, your first step would be to import them onto your computer, using iTunes program on your Mac or Windows. If you have them on CD, iTunes has an option to import those files as well. Once you have your audio files in iTunes, connect your iPhone to the computer using the cable, and find the option in iTunes where you can sync music. Check the box where your audio file or folder is, and click sync. Within few minutes all your files should be on your phone, so all you have to do now is go to Mind Hero app and use import feature. Voilà, all your favourite relaxations are now at one place, you can enjoy benefits of various features such Aura Score and Zen Moments, making your relaxations a fun experience. If you have issues with import, please drop us a message, we will assist you.